Gross Area: 32,815 sq. ft.
Area Per Student: 107.24 sq. ft. 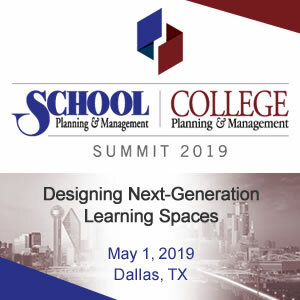 In early planning discussions with the administration, faculty and stakeholders, McGill Smith Punshon (MSP) offered challenging questions of what to build for a school that will operate effectively in the 21st Century. Resulting concepts discussed including Blended Learning, Mastery and Project Based Learning, which were already being utilizing effectively in their school for the arts. Using knowledge gained from that school, the planning team developed and implemented a model for the 21st-Century Bioscience School. The program for teaching and learning evolved into a no-bells classroom concept where no teacher owned a classroom with designed flexibility in all spaces to accommodate a personal education format for students to progress at their own speed. The resulting facility includes lab space for State Tested Nursing, a Simulation lab, Medical Assisting, Dental Assistant Lab, a Flexible Science Lab, Project Lead the Way, and an Exercise Science lab. 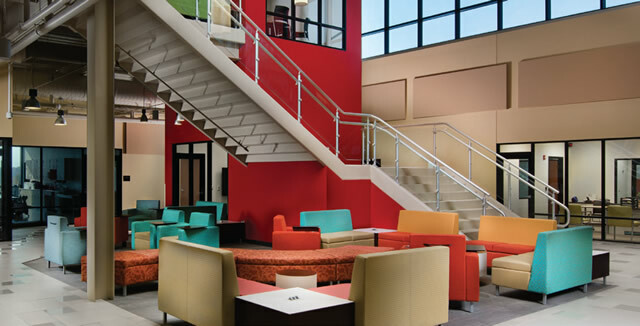 Design of the program involved the creation of a collegiate style interiors featuring four classrooms, six bioscience labs, a large multi-purpose room and four enclosed huddle rooms with glass doors and walls for transparency with all spaces including administration opening to a two story “Learning Commons”. The design features a variety of types of flexible and moveable seating in the classrooms and open spaces to promote project collaboration, faculty interaction and study space that invites privacy. Classrooms are designed for schedule use without ownership by any one faculty member. The goal is to move faculty out of a classroom and into the commons for opportunities for communication and collaboration with students. One of the basic concepts of the design for the proposed learning environment was to create a very upbeat environment that causes students to want to be present in a dynamic building and space. 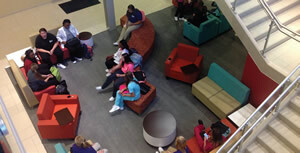 Utilization of unique building design, multi-story open space, lots of natural light, upbeat color and moveable furniture in a large multi- purpose space that includes restaurant style booths with a variety of seating options were selected to represent a learning environment that is attractive and geared to 21st-Century life styles. The openness of the facility is set to allow modifications in the change in the space needs of classrooms and labs. As an example, recently, faculty offices and a conference space have been relocated to the basement level of the building to accommodate a new classroom to meet the demand for student growth. The design is also constructed to accommodate a Phase 2 expansion of an additional floor on top of the existing school and administration areas planned for future growth. One of the basic tenants of the planning effort was to realize that technology is changing the delivery of teaching and learning at a rapid pace. The goal of the planned openness around a learning commons is to allow for potential changes that will evolve during the life of the building. The open spaces of the multi-purpose room, the commons, the collaboration spaces and the huddle rooms all are potentially adaptable. A central utility core extending from the basement mechanical space along with exposed ceiling and roof structure is set to allow modifications and expansion of infrastructure for future changes. MSP played a significant role in the selection of the site by developing a process of evaluating multiple sites for their location related to area bioscience stakeholders. Accessibility and a high level of visibility within the community was a priority. The final site is strategically placed near 4 major hospitals and a number of pharmaceutical manufacturing companies with the commitment to train personnel for these institutions and significant input was provided by the healthcare and biomedical community, workforce development providers, higher education institutions, the architect, Butler Tech’s administration and a development consultant to position a potential concept for development adjacent to the bioscience center. Through MSP’s master planning of the total 27-acre site, seven plus acres are now being promoted as a high-profile location for a bioscience public-private development on that site. As part of the area master plan developed by MSP, an adjacent 75-acre property includes a new county roadway with mixed-use development potential including corporate, health care and bio-industry uses. The Bioscience Learning Center is a core element in the planned bio-industry development on the combined sites. Sustainable design is a critical factor for Butler Tech’s District facilities. 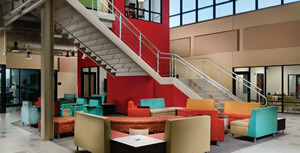 While sustainable design was a high priority, the school administration declined to seek LEED certification. To meet those requirements, selection of materials, building shell design and especially MEP systems were designed to meet or exceed sustainable design standards. 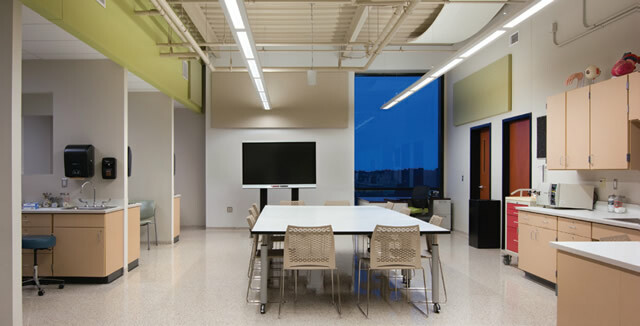 For the building shell, glass treated for freeway sound was utilized in large areas to support the need for light in classrooms while labs needing extensive wall space limited glazing to create a conservative balance of energy usage by the building shell. MEP systems were designed to exceed the standards for energy conservation for mechanical and electrical systems. All site work was maintained on site with no waste materials removed. Soils and plant materials were placed in undevelopable areas on site. A key aspect of the Bioscience Center design is to provide adequate transparency throughout the total center for visual control. Electronic access control in the facility was also a key design factor. The Learning commons functions surrounding the open space with glass doors and walls into all classrooms, labs and huddle spaces allows visual control by faculty and administration to be readily maintained. Secure access is also provided by electronic controls and alarm systems at all means of entry and egress for the facility with a visual control by the main receptionist at the main entry vestibule. A bullet resistant wall and glass between the reception and vestibule was made to significantly reduce risk for school personnel. Locations of means of emergency egress are remotely located from each other to provide ready access in case of emergency with an audible warning if opened inappropriately. During the design phases of the project, local fire and police officials met with MSP to review the security of the building and systems selected. The project began with the client noting that approximately $10 million was available for the construction of the proposed learning center. MSP worked with CM at Risk, Shook Construction to continually monitor the project cost throughout each phase of design as well as monitoring the estimated costs of furnishings and technology as provided by the Client. As a result, the final GMP including scope additions and minor site changes finally came in at $10,634,312 with no additional costs due to design documents. Effectively, the client approved the resulting project costs with significant positive response to the completed project. 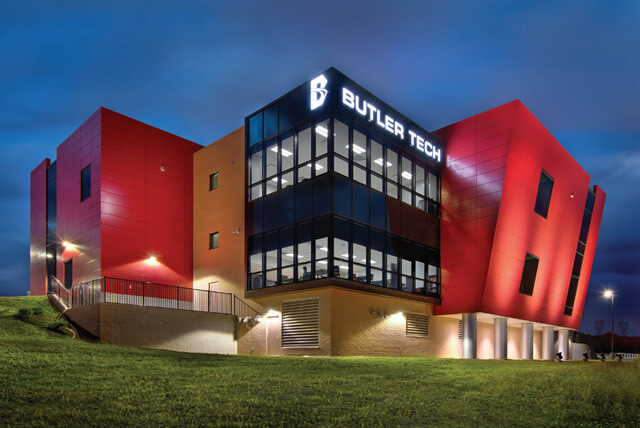 The Butler Tech Board of Trustees recognized that the new Bioscience school as a school of choice needs to be “branded” to attract students and establish the image of a school that is leading education for the Bioscience industry. As a result, the board mandate to MSP for design was threefold. 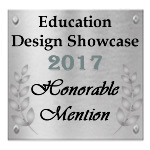 First, it was to create a functional design that responded to the desire to create a collegiate type of learning environment to raise the level of expectation of performance for the students. Second, the expectation was to create a flexible facility design that responds to the new pedagogy that will result in a 21st-century school that leads the way in education. Finally, and third, the board directed MSP to create a design that is unlike any other building on the I-75 corridor, a major north-south interstate highway to brand the new facility. Now, in its third year of operation, a new classroom had to be added to the existing facility to accommodate 306 students. For the fall of 2017, the school experienced applications from 324 junior students and could only accept 188. The administration feels the response of the design supporting the cutting-edge learning environment as well as the strong brand and the high expectations of the collegiate style environment has gained positive notice from students, parents and businesses in the district is serves. Strategically selected site, near medical centers is a nice touch. Built for change. Limited number of traditional classrooms. Nice learning spaces. Good planning process.